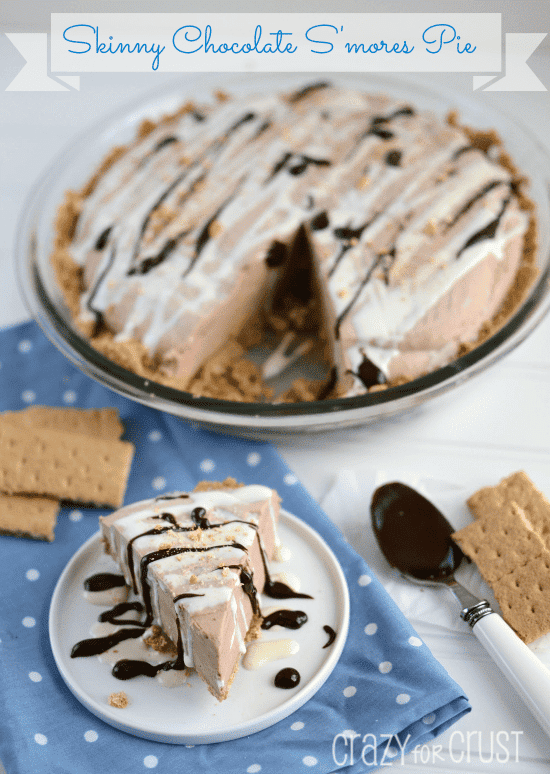 You might be thinking: aren’t all s’mores no bake? True…but these s’mores bars are even more no bake, because you don’t need a BBQ, campfire, or any sort of heat source to make them. These No Bake S’mores Bars have only 4 ingredients, come together in literally minutes, and you can make them indoors. That’s perfect when it’s over 100° every day. Who wants to go out in that? Every summer I think it must be the hottest summer on record. And every summer someone reminds me that this 90-110° super hot weather in Sacramento is normal. I know they’re right but jeesh. It feels like the hottest summer ever here. I’m either getting old and turning into that woman who fans herself constantly (even in the grocery store) or my heart is in San Francisco and I just want it to be foggy darn it! What’s funny? When I lived in the Bay Area (grew up there; moved away kicking and screaming when I was in my 20s) I complained every summer because it was never hot enough to wear shorts. And if it was a heat stretch that reached the 90s, I complained because there was no A/C. It sounds to me like I’m kind of a complainer. Huh. Maybe I should just shut up now and talk about no bake s’mores. There’s no complaining about these, especially because I don’t have to camp to eat them. And we all love how much I love my indoor s’mores. In fact, I never make them outdoors; I just make them into cookies and dip and bars and pie. I don’t think these s’more bars are a new invention. I’m pretty sure there are about a gazillion recipes for this on Pinterest. I decided not to google and let myself think that I’m so freaking smart. Plus, it was a way to make s’mores in about 5 minutes without going outside and I got to use one of the best cereals ever: Golden Grahams. Want to know a really unkept secret? I pink puffy heart kid cereal. If left to my own devices, I’d eat Golden Grahams for breakfast, Fruity Cheerios for lunch, Reese’s Puffs for snack, and I’d top my nightly ice cream with Frosted Flakes. Going grocery shopping in the summer (aka with Jordan) is really hard for me. She always begs for kid cereal and I have a really hard time saying no. She knows how to work the system (it also works with books and shoes). One day we came home with a box of Golden Grahams and I knew I had to make s’mores with it. This recipe has a whopping total of…4 ingredients. Golden Grahams, mini marshmallows, chocolate chips, and shortening or oil to smooth out the chocolate. You can leave out that last part but then it’ll be really hard to cut the bars. So…don’t leave it out. You can use Crisco or vegetable/canola/coconut oil. Anyway, melt your chocolate, mix in your cereal and marshmallows, press into a pan, chill and boom. 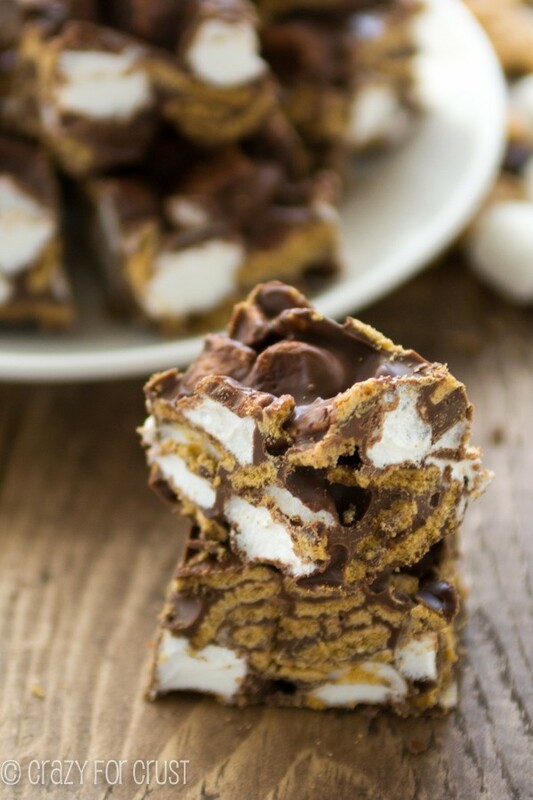 No Bake S’mores Bars. So easy kids can make them. The kids will love to eat them too. But, er, I’m not sharing. 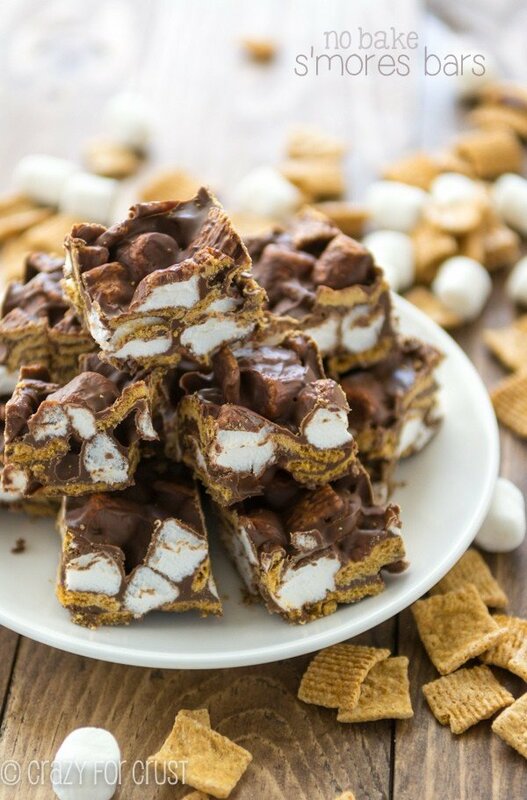 These No Bake S’mores Bars have just a few ingredients and take just minutes to make! EASY No Bake S'mores Bars - this easy indoor s'more recipe has just 4 ingredients and the kids can make it in minutes! Stir in the Golden Grahams and marshmallows. Pour into prepared pan. Press to compact (this is a messy step!) Chill until set. Slice into squares. These melt like candy, so I suggest keeping them in the refrigerator if you’re not eating them right away. They taste best after the sit at room temperature for a few minutes. Store in an airtight container; they’ll last about a week. 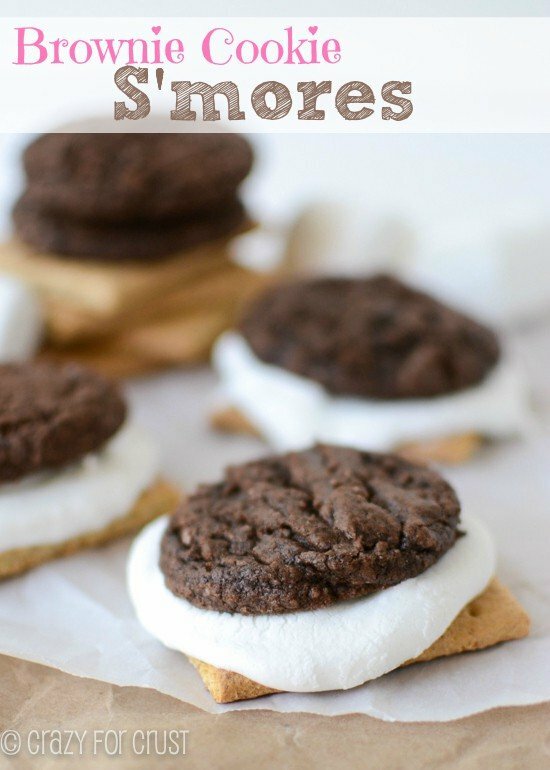 If you love S’MORE RECIPES be sure to check out all of mine. I’ve got tons, from blondies to trifles to cheeseballs. 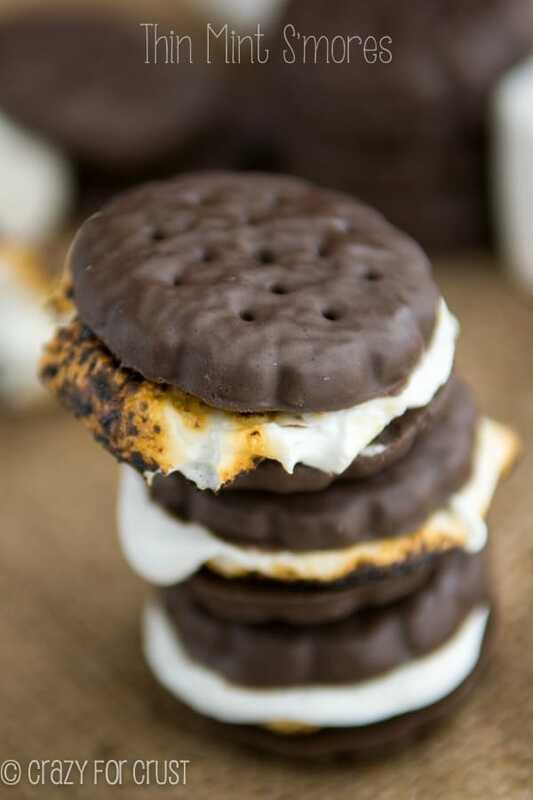 And be sure to check out some of my other favorite s’more recipes, like Pretzel S’more Bites from Well Plated, S’mores Fudge from Wine & Glue, and S’mores Cookie Pie from Two Peas & Their Pod.